A worse-than-expected storm on the third day of the race wreaked havoc on over 303 yachts that started the biennial race, resulting in 19 fatalities (15 yachtsmen and 4 spectators). Emergency services, naval forces, and civilian vessels from around the west side of the English Channel were summoned to aid what became the largest ever rescue operation in peace-time. This involved some 4,000 people including the entire Irish Naval Service's fleet, lifeboats, commercial boats, and helicopters. The 1979 race started on 11 August. BBC Radio shipping forecast, broadcast at 13:55 that day predicted "south-westerly winds, force four to five increasing to force six to seven for a time." By 13 August, winds were reported at Force 6, with gusts of Force 7. Forecasters were predicting winds of Force 8. The leading boat, Kialoa, trailed closely by Condor of Bermuda, was on course to break the Fastnet record set eight years earlier. A large depression, known as "low Y," formed over the Atlantic Ocean during the weekend of 11–12 August. On 13 August it began to intensify rapidly and turn northeastwards, reaching about 200 nautical miles southwest of Ireland. By the 14th, the low was centred over Wexford. Land-based weather stations reported gale-force winds, with the strongest winds out to sea over the race area. The Meteorological Office assessed the maximum winds as force 10 on the Beaufort scale; many race competitors believed the winds to have reached force 11. Lowest pressure was 979 hPa. This seminal disaster resulted in a major rethink of racing, risks and prevention. The coastguard requested support resulting in a Nimrod from Kinloss being ordered to the scene to act as the Scene of Search Coordinator. As the scale of the disaster became apparent other rescue assets were requested and HMS Broadsword was ordered to the scene taking over as the Scene of Search Coordinator on arrival 17:30 on 14 August. ^ place awarded by Race Committee under rule 12 for loss of time in rescuing crew from yacht Griffin. Of the 303 starters, only 86 finished. There were 194 retirements and 24 abandonments (five of which were "lost believed sunk"). 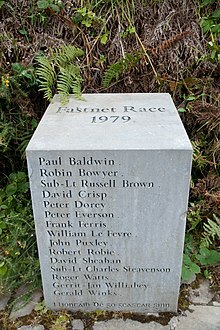 The Fastnet Race Memorial at Holy Trinity Church, Cowes, Isle of Wight lists 19 fatalities, the 15 above and Olivia Davidson, John Dix, Richard Pendred & Peter Pickering who were aboard Bucks Fizz (a yacht shadowing the fleet to view the race). Denis Benson and David Moore were lost from Tempean (not a competitor). Their names were added to the Fastnet memorial at Cape Clear Island harbour. ^ a b c d e Forbes, Laing & Myatt 1979. ^ Paterson, Tony (18 July 2009). "Hell and high water: The Fastnet disaster". The Independent. Retrieved 17 April 2015. ^ Siggins 2004, pp. 49. ^ "Yachts and boats on Internet Video". Sunzu.com. Retrieved 17 April 2015. ^ "Exceptional Weather Events: The Fastnet Disaster" (PDF). Met Éireann. Archived from the original (PDF) on 22 May 2012. Retrieved 28 March 2012. ^ Knox et al. 2011. ^ "Fastnet 79: The Disaster that Changed Sailing (Eye witness accounts)". Yachting World. Archived from the original on 23 December 2015. Retrieved 24 November 2013. ^ a b c Rousmaniere 2000. ^ Pardey, Lin (2008). Storm Tactics Handbook, 3rd Ed., Modern methods of heaving-to for survival in extreme conditions. Arcata, California: Pardey Books. p. 97. ISBN 978-1-92921-447-1. ^ Ward 2008, pp. 264-273. ^ Siggins 2004, pp. 50. ^ Corin & Farr 1983, pp. 120. ^ "Cowes : Holy Trinity Church - Fastnet Race Memorial". Memorials & Monuments on the Isle of Wight. Retrieved 16 April 2015. ^ "Fastnet Tragedy Memorial Service". Extract from Southern Star newspaper. Humainst Association of Ireland. Retrieved May 12, 2017. ^ Laven, Kate (4 August 2009). "Cowes Week 2009: Kieron Kennedy admits he was 'lucky to survive' 1979 Fastnet Race". Daily Telegraph. Retrieved 16 April 2015. Forbes, Sir Hugh; Laing, Sir Maurice; Myatt, Lt. Col. James (1979). "1979 Fastnet Race Inquiry" (PDF). Royal Yachting Association, Royal Ocean Racing Club. Retrieved 3 July 2012. Knox, John A.; Frye, John D.; Durkee, Joshua D.; Fuhrmann, Christopher M (1 February 2011). "Non-Convective High Winds Associated with Extratropical Cyclones" (PDF). Geography Compass. 5 (2): 63–89. doi:10.1111/j.1749-8198.2010.00395.x. Retrieved 28 March 2012. Rais, Guy and Bramwell, Christopher (15 August 1979) 10 die in yacht race havoc Daily Telegraph, p. 1 & 32. Roy, Amit (17 August 1979). "Last of the Fastnet race yachts found". Daily Telegraph. p. .
Wettern, Desmond (20 August 1979) Fastnet race rescue operation involved 4,000 people Daily Telegraph, p. 2. "1979: Freak storm hits yacht race". BBC News. Retrieved 24 November 2013. "Fastnet 79". yachtingworld.com. Archived from the original on 23 April 2015. Retrieved 17 April 2015.
pjwellsify (28 September 2012). "The Fastnet Yacht Race Tragedy of 1979" (Video). YouTube. Retrieved 17 April 2015.